Last week the Howard Hughes Medical Institute announced that they will be funding Danny Reinberg, Shelley Berger, and Juergen Liebig to sequence three ant genomes. Their interest is research on aging, hoping that solving the puzzle of why genetically identical ant nestmates can either live for a year as a worker or twenty as a queen will unlock some clues to aging in our own species. I think that’s a stretch, but whatever. 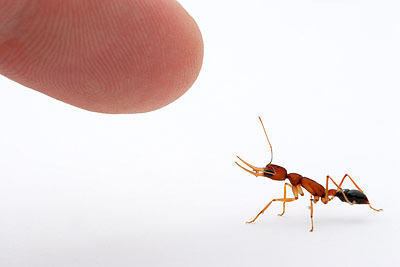 We myrmecologists will be able to probe the ant genomes for plenty of other worthwhile reasons. Three species were chosen to represent varying levels of caste differentiation. Harpegnathos saltator (pictured) is a ponerine from India with gynes that are scarcely different from workers. Camponotus floridanus is an American formicine with more strongly differentiated gynes and a polymorphic worker caste. And an as-yet-undetermined species of Pheidole will represent an ant with multiple discrete worker castes. Genomic information compared among the castes of these species will allow us to pinpoint genes and regulatory pathways that determine both the morphological and the behavioral differences among the castes. Cool stuff. Here’s a prediction. Since the worker caste appears to have evolved only once, at the origin of the ants, the developmental pathways that determine whether a female becomes a gyne or a worker will be shown to be fundamentally the same across all species. In contrast, differentiation within the worker caste evolved multiple times, so those mechanisms among species will show differences. Specifically, the genes expressed to make a major Camponotus should not necessarily be the same as those needed to make a soldier Pheidole. With these genomes in hand it will be considerably easier to see if this is indeed the case. I should note that three additional ant genomes (Solenopsis invicta, Linepithema humile, and one of the leafcutter ants) are in the works by other research groups. So we myrmecologists will get six genomes to play with in the next few years, and as full genome-sequencing drops to less than $10,000 we’ll likely see several more as well. Exciting times!